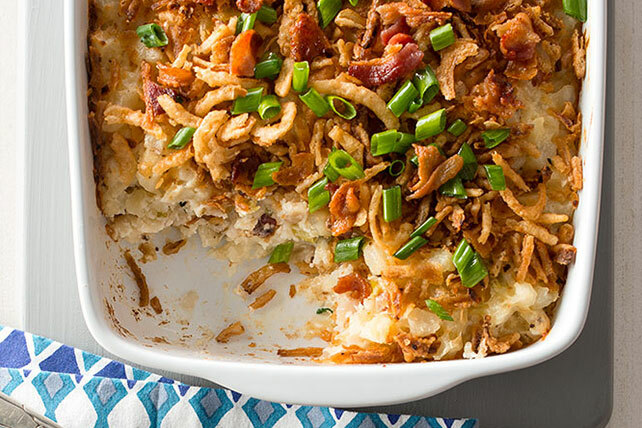 Frozen Southern-style hash browns and cooked bacon make this Easy German Potato Casserole a snap to prepare. Mix soup, sour cream and vinegar in large bowl until blended. Add hash browns, cheese, half the bacon and 1/2 cup green onions; mix lightly. Bake 50 min. or until heated through, topping with French fried onions after 20 min. Sprinkle with remaining bacon and green onions. You'll know it's a special occasion when you get to enjoy a serving of this delicious casserole. Prepare using any other white KRAFT Cheese, such as KRAFT Shredded Mozzarella Cheese or KRAFT Shredded Italian* Five Cheese with a TOUCH OF PHILADELPHIA.